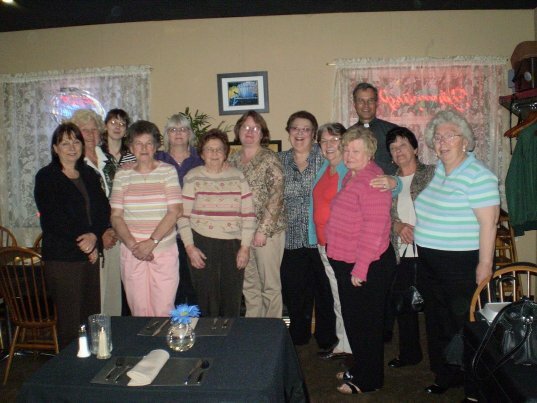 Members of the Sacred Heart Society met for the annual Mother's Day dinner on Thursday, May 6th, 2010 at the State Hill Restaurant in Berwick. The annual dinner is given in appreciation of the members' hard work and dedication to the Church and the community. From left to right: Joan Creasy - Vice President, Alice Starr, Charity Trapane - Secretary, Mary Ezzyk, Linn Trapane, Lottie Fedorco, Janina Everett - President, Pat Redden, Barbara Lylo, Fr. John Seniw - Pastor, Marjorie Matash - Treasurer, JoAnn Fedorco, and Shirley Fowler - outgoing President. Members missing from photo are Judi Pypiak and Melanie Henry. Click the image for a larger view. (1) Honoring Jesus Christ and understanding the true meaning of His love so that members may act with love sincerely toward others. (2) Having more Faith, Hope and Charity and showing it in everyday life. (3) Working for our church's needs and beautification. The group often organizes, cooks, and prepares for events within our church such as parish dinners, craft and ethnic food sales, and other fundraisers. The ladies meet on the first Thursday of every month in the church hall to discuss current events and issues in our parish and to enjoy good conversation and friendship. New members and guests are always welcome!